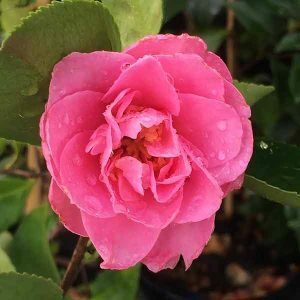 Although not new, Camellia Marge Miller has recently been rediscovered by landscapers. This is a variety with unique characteristics, it is low growing, with what is best described as a natural weeping habit. It is in the form of a weeping standard that it is now becoming popular. Being a sasanqua type it is also fairly sun tolerant, so it has become an interesting ground cover plant. Evergreen and with very attractive pink flowers from early winter into spring. Over recent years Camellia sasanqua Marge Miller has also been used as a weeping standard, where it is grafted onto an upright under stock. In this form it makes an excellent specimen plant both in the garden or in a container. Use it in the garden as a ground cover, or allow it to grow on an embankment or on the top of a retaining wall where it can be allowed to weep gracefully over the edge. Climate wise this is a very adaptable plant, it grows well in Melbourne, Perth Adelaide and Sydney. In Brisbane and the the higher elevations of southern Queensland it also thrives. This is an Australian bred and developed plant that is now sold around the world. Best grown in a humus rich, well drained and slightly acidic soil. If you are going to grow ‘Marge Miller’ in a container, we suggest using a specialist camellia and azalea potting mix. Position – Best in full sun with a little afternoon shade. Flowers – Fully double and a rich pink. Flowering period – Early winter to spring. Drought tolerant – Medium once established as long as the soil is mulched and the plant has a cool root run.